Hamptons Medical Associates Providers Steven Caridi, M.D. 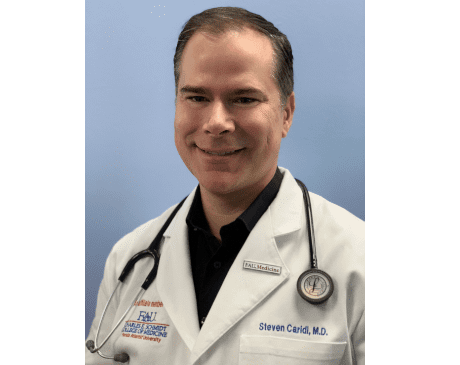 Dr. Steven Caridi has practiced family medicine for 18 years and takes great pleasure in forming lasting relationships with his patients. Dr. Caridi also specializes in aesthetic services and offers his broad range of expertise to the community of Boca Raton, Florida. An accomplished family practitioner and educator, Dr. Caridi was trained early in his career in cosmetic procedures. His interest in aesthetics developed through his experience with family medicine, which showed him the connection between self-confidence and overall health and wellbeing. He is pleased to make aesthetic services available to patients at Hamptons Medical Associates. Dr. Caridi is on staff at Boca Raton Regional Hospital. He is a preceptor for Nova Southeastern University and an Assistant Professor of Family Medicine at the Charles E. Schmidt College of Medicine at Florida Atlantic University. After graduating from St. George's University School of Medicine, Dr. Caridi completed his residency and chief residency through the Joan Sanford I. Weill Medical College of Cornell University at the Brooklyn Hospital Center in New York. Dr. Caridi holds medical licenses in Florida, New York, and Connecticut. He is board certified by the American Board of Family Medicine.